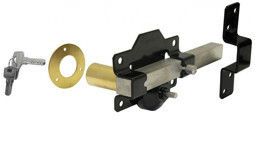 RJ Joinery are pleased to introduce a new product line - 'The Compact Range'. Smaller in depth and height in comparison to our standard size stables and field shelters but still keeping the high quality we pride ourselves on. 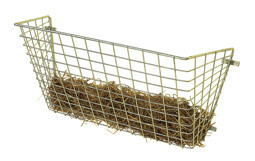 A purpose built box, which has been designed especially for ponies or horses that are 16 hands and under, using only the best material and construction as in the RJ Joinery loosebox. A beautifully made box with a very pleasing appearance and made to withstand a long life of hard work. 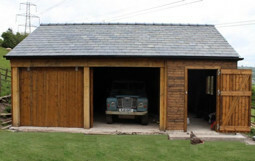 Our pony boxes are of all timber construction, have an apex timber roof, and are sectional in design. Our standard size is 3.05M X 3.05M (10'X10'). They are 2.29M (7'6") high at the eaves (rear) and 2.785M (9') at the apex, giving adequate height for even the tallest pony. A 305mm canpoy is included in the design with a clearance height of 1.99M. We provide the highest quality products at competitive prices with personal attention, giving you the customer, a first class service. 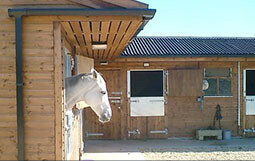 We have four points that our equestrian buildings are based on - Strength, Practicality, Ventilation and Appearance. The panels in our buildings are bolted together, rather than nailed, creating much more stability. Not only do we supply the buildings, we can also supply you with doors, windows, ironmongery and chewstrips in standard and custom sizes and finishes. In all of our buildings we use a stress graded studwork c16 or similar size depending on the span and height of the building; with a 19mm X 100mm Redwood tongue in groove shiplap cladding and lined internally with 18mm OSB Kickboard to 1220mm high as standard. All buildings have a specifically designed truss system that makes the roof stronger than most others on the market as well as offering additional height internally. Once the panels, doors and windows have been manufactured, they are immersed in our tank to be treated in a golden brown oil based preservatice; this ensures that all saw cuts are treated before installation. 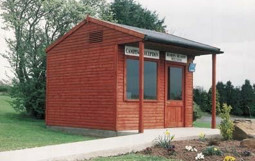 There are a variety of options available to choose from including roofing material, finished colours, external cladding, interior linings, guttering, and finially whether your building is to be mobile or permanent.